A “sign” of things to come…. Annual Town Elections are Tuesday, June 8 and there is an important race for Select Board with two seats being contested by four candidates. The outcome of this SB election will likely be very important with regard to the future of Longmeadow given that 2 out of 5 voting members will be selected. There is also a contest for a School Committee seat. In addition, there is likely to be a ballot question regarding a Proposition 2½ debt exclusion override for the new high school. See posting on the Longmeadow Community Bulletin Board for additional election race details. With so much at stake our town could easily become the lawn sign capital of western Massachusetts. Below is the town bylaw covering the placement of lawn signs in advance of an election. (e) A temporary sign relating to (i) a candidate for public office, or (ii) an issue which will be voted on at a town meeting or election, or (iii) some other issue which may be of general concern, interest or controversy or (iv) a scheduled function, event or activity sponsored by a non-profit organization, may be erected by the owner of property in any zone or by permission of such owner, but subject to the limitations set forth in subsection (c). (ii) Temporary signs permitted by subsection (e) (i), as limited by section (e) (i), or signs permitted by section (e) (ii) may be erected no sooner than sixty (60) days prior to the election or meeting at which the candidates or issue will be voted on and must be removed no later than two (2) days after such election or meeting. This means that Friday, April 9 is first day that lawn signs can be placed without violation of our town bylaw. 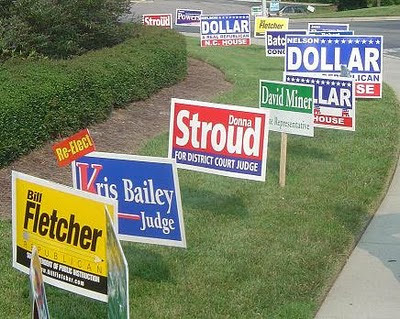 There have been past town elections that seemed to suggest that the more signs the better since the election would be determined by who had the most signs on the major streets in town. Let’s hope that town voters are smarter than that and will make informed decisions based upon knowledge of the candidates and/or issues rather than relying upon sign counts. I ask that each election committee for SB and SC candidates and the expected pro/con political action committees related to the new high school project consider limiting the number of signs placed on lawns to 100 or less so our town does not become the lawn sign capital of Western Massachusetts. Longmeadow is such a beautiful town in the springtime.